In regard to being in the choir, to me it was wonderful. 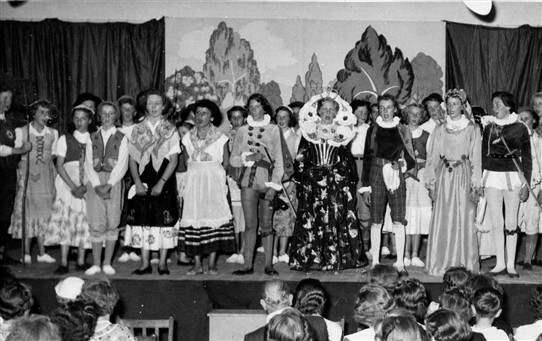 I was shy, and singing really helped me, as I ended up a soloist with Mr. King’s help.There were two musicals at school, the first was “Hansel and Gretel ”I played the Sandman, in 1955 and “Merry England”on 26th July 1956. This was performed on the 25th Anniversary of the School. In my last year at Green Wrythe when I was 14, someone lost a loved one in the parish of St. Peters Church and wanted a choir to sing at the Funeral. Mr. King volunteered us and we sang “Parnis angelicus”. It was a very moving experience for me, as I had not attended a funeral before. I think all the girls enjoyed choir, Mr. King was a great teacher. I do not remember all the girls names but I do remember them. 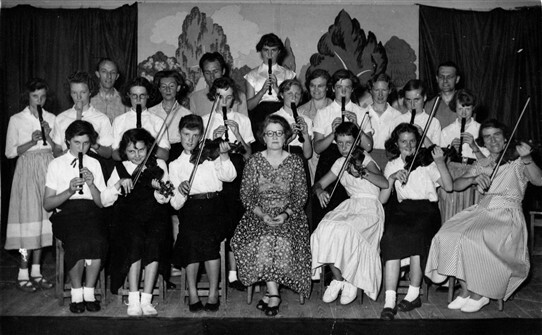 Mrs Weller who was the Domestic Science teacher gave up her time once a week after school to help the orchestra, teaching the girls the violin. Some of the other teachers were Mr. L.R.King, Music & Math, (loved by all). Miss. Rodway, not sure now, what she taught., Mr. Thomas, French & English (quite a character). Miss. Hague, Domestic Science (Good teacher). Miss Morrison, not sure what she taught. Mr. Brown, Art (Good teacher) Mrs. Lavery, Head Mistress, (she had red hair). Miss. Hislop weaving & dying wool, second under Mrs. Lavery , Mrs. Mackenzie sewing, (Good teacher, I still remember picking up all those pins off the floor.)Mrs. Marshal, History. Mr. Hurry, Science (nice teacher & family). Miss Lambkin, Gym. Mr. Beadle? Geography and Math, brilliant man. Valerie West was Queen Elizabeth 1st. Esme Hancock was one of the other actors. Can anyone name any more cast members? Isabel Bailey a famous Opera Singer conducting school choirs from the surrounding area, at a hall in Carshalton. Sylvia is in the 3rd row from the top clearly visible on left with pony tail. 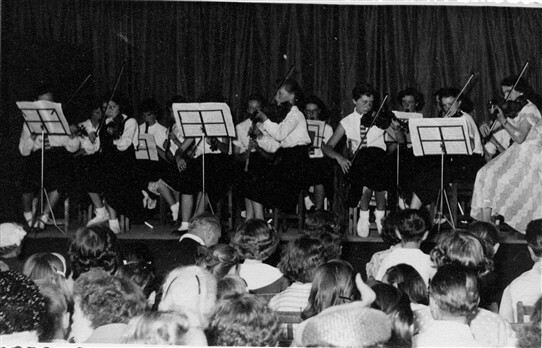 The Orchestra and Teachers.From left to right, Mr L. R. King, Miss Rodway, Mr Thomas, Miss Hague, Miss Morrison, Mr Brown and Miss Lavery in the centre. This page was added by Sylvia Ramsey on 01/11/2016. These photos are wonderful and I do wish to thank Sylvia for sharing them. 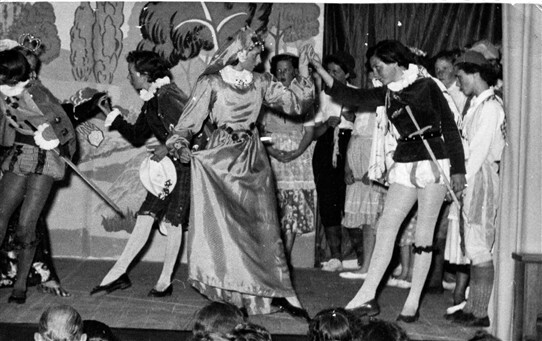 They are slightly before my time, as I attended GWL Girls' school from 1958 - 63. I especially like the one which includes the teachers - they all look so incredibly young! I can remember that the school put on lots of exhibits etc for their 25th birthday which I visited. My time at the school wasn't happy and I couldn't wait to leave. 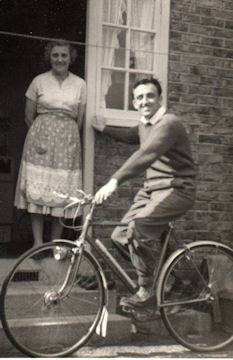 I much preferred the men teachers to the women, especially Mr King and Mr Hurrey. I do owe Mr King a lot of gratitude as he taught me to play the recorder, the most useful thing I achieved in my school life! I continue to play and am in 2 bands! I wish Mr King was around so I could tell him! Miss Morrison taught English and French. Mrs Lavery was a real dragon, she taught my form Latin and I lived in fear of her. 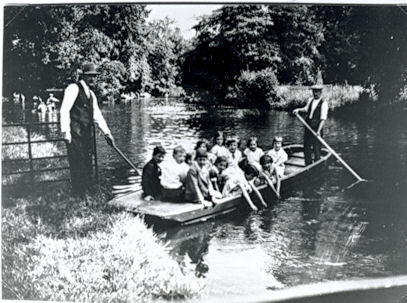 Schooldays the happiest of one's life? Not likely! 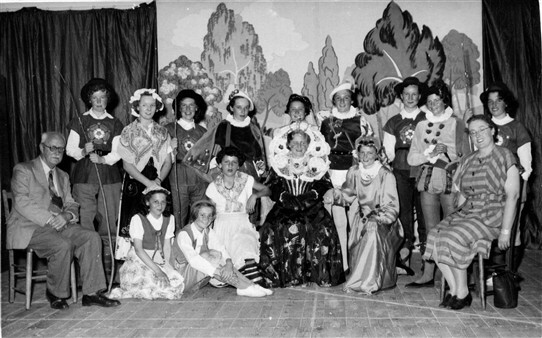 I attended GWL from 1952 /1956 my name was Janet Pope, I have recently got in touch with Kathy Wythe. We have had such fun remembering girls we used to go to school with. She lived at the Circle and I lived in Shap Crescent. Any one remember us all that time ago? We were great netball players. I remember Janet Pope & Jean Cook who used to hang around together, do you remember there were two girls named Brenda Hall? I wonder what happened to them & to all our class mates. I have been in touch with Joan Best she is living in Australia, I have been living in Michigan USA since 1960. Hi - I remember Mr.King, was in the choir in 1952. Trying to put names to memories isn't that easy is it? I went to Glastonbury Road school in 54/5. I lived in Green Wrythe Gdns. next to Heather Jay. My Mum died when I was 8 in the Juniors which was so hard but I had good friends at school which helped a lot. Just reread the above - oh no! remember poor Miss Hislop who often opened Assembly and we would all call Good Morning Mrs Slop - gosh how awful we were! Miss Lambkin was sort of fun until she got fed up with us and we had to run around the field for ages! 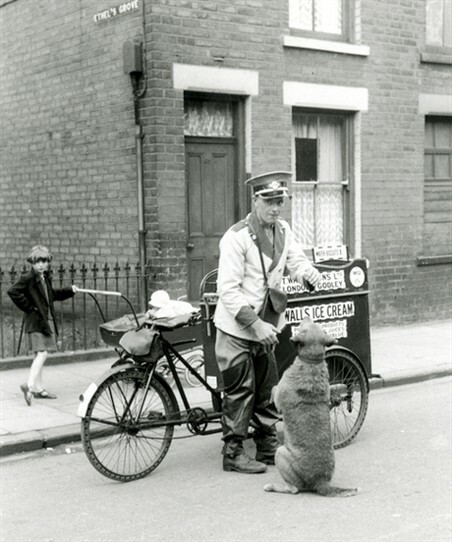 Hi- I remember GWL junior school i came at a time when Miss Johns (Headmistress) took over I had experience her at Welbeck road infants, she used to shout "Girly" because she could not remember your name, she had a Standard 10 which she use to rev high when driving. I went to Winchcombe in the end she was just to much, Apparently teachers had threatened to resign if she went there. 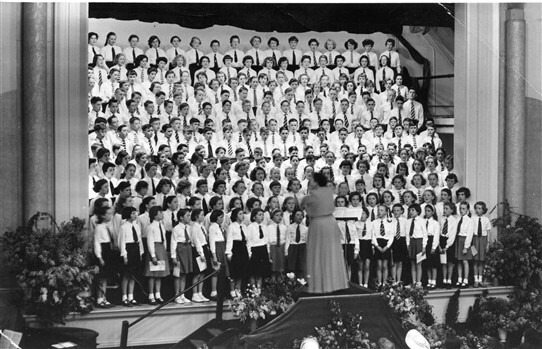 I also well remember the Choirs I took part in the festivals I wonder what year your photo is they were great and i carried on through best part of my life belonging to a choir of some kind.